Please refer to our stock # Misc174 when inquiring. Probably used once and then packed away for another generation, this vintage silk traditional sari from Varanasi is a vibrant as the day it was loomed. A small leaf pattern of gold metallic thread dots the entire length of the deep green silk field. 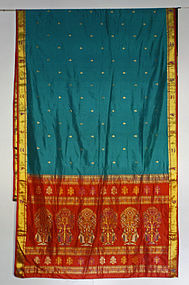 There is a 2 inch brocaded border on each side which also runs the length of the sari. The end panel is ornately patterned brocaded silk and makes extensive use of gold metallic threads. Throughout India, Varanasi sari are highly prized as wedding saris. Only a section can realistically be shown in a photo, the full length it measures approx 19 feet long and 43 inches wide.